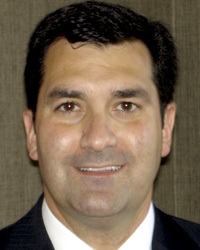 After 10 years in the car business, Keith Caldarera joined Parker Lexus in 2001 as the general manager. Since then, the company has seen a doubling of revenue and been named by Lexus as the No. 1 dealership in customer satisfaction in the country. Before joining Parker Lexus, Caldarera worked as the sales manager for North Point Auto for about five years and as the sales manager for Riverside Motors Group for about five years. Meanwhile, Caldarera served as head football coach for Our Lady of the Holy Souls School from 1990 until 2003. As a survivor of heart disease, Caldarera, 39, is an active board member of the Pulaski County chapter of the American Heart Association. He is chairman of the 2008 AHA Golf classic and volunteered for the St. Vincent Auxiliary Men's Tennis Tournament. He also helps whenever possible with St. Vincent's New Outlook program, which is a women's cancer recovery service that helps women deal with the effects of the disease and its treatment. Caldarera's personal philosophy reflects his drive to revamp the public's image of car dealers. "If you treat people fair and you're honest with people, good things will happen," he said.